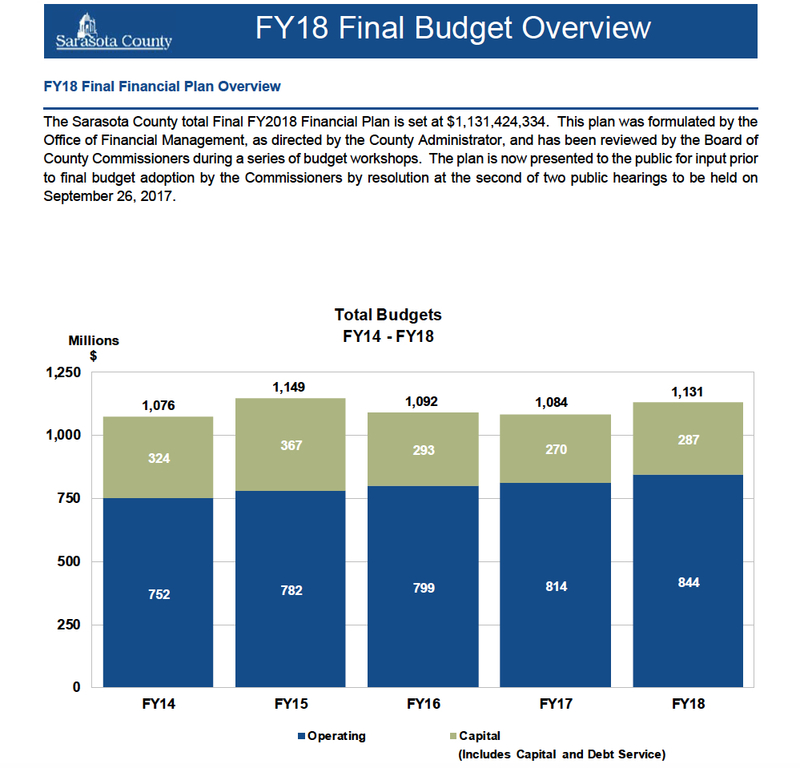 In accord with the direction the Sarasota County Commission gave staff during its public hearings on the 2018 fiscal year budget, work has begun on ways to replace the approximately $10.8 million a year that a proposed Public Service Tax on utility usage was expected to bring the county. The ultimate goal not only is to plug future budget gaps without that revenue but to start building back up the Economic Uncertainty Reserve Fund that prior boards created to help with budgets during a recessions. Nothing is off the table, commissioners indicated in their first discussion of county finances since the new fiscal year began on Oct. 1. Chair Paul Caragiulo emphasized that his preference is to see department cuts addressed thoroughly. On a unanimous motion, the board members asked staff to begin an expansive review of all financial options and report back on their progress before January 2018. 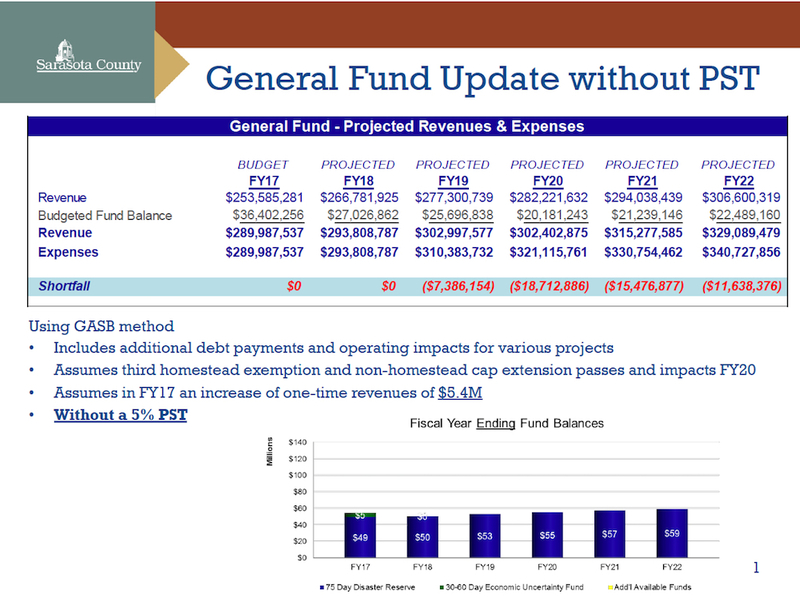 The board’s near-term objective is to have no projected shortfall within the current fiscal year or FY19. Staff should propose ways the board can replace $5.4 million from its Economic Uncertainty Reserve during the current fiscal year. In the motion Commissioner Alan Maio made during the Sept. 18 budget hearing, that extra amount was to come from the “rainy day” reserve fund to ensure the budget would be balanced. However, that was just a temporary means of plugging the gap created by the board members’ decision not to impose the Public Service Tax. The $5.4 million represented the amount of revenue staff expected the tax to generate this fiscal year. Assistant County Administrator Steve Botelho, who also serves as the county’s chief financial management officer, had explained that because of state guidelines, the earliest the tax could have gone into effect would have been April 2018; therefore, the tax would have been effect for only six months of this fiscal year. The board will need to find recurring means of adding $10.8 million a year to the future budgets. Lewis explained that staff has been searching for recurring savings and for one-time revenue options. 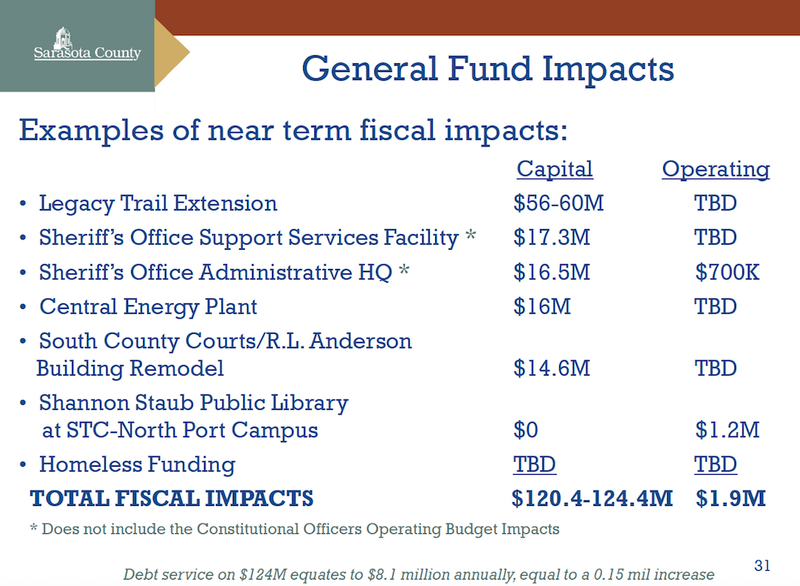 However, he pointed out, staff will look at potential spending reductions only in the budgets of departments over which the County Commission has control; their spending represents 44% of the General Fund. Those budgets could be adjusted by April 2018, he said. The goal would be to reduce department expenditures about 10% overall, Botelho noted; some departments might see no cuts, while others would see more significant reductions. The rest of the General Fund, Lewis reminded the board, is divvied up among the budgets of the county’s constitutional officers — such as the sheriff and the clerk of the circuit court and county comptroller — and departments whose funding is generated by fees, such as the Public Utilities Department. 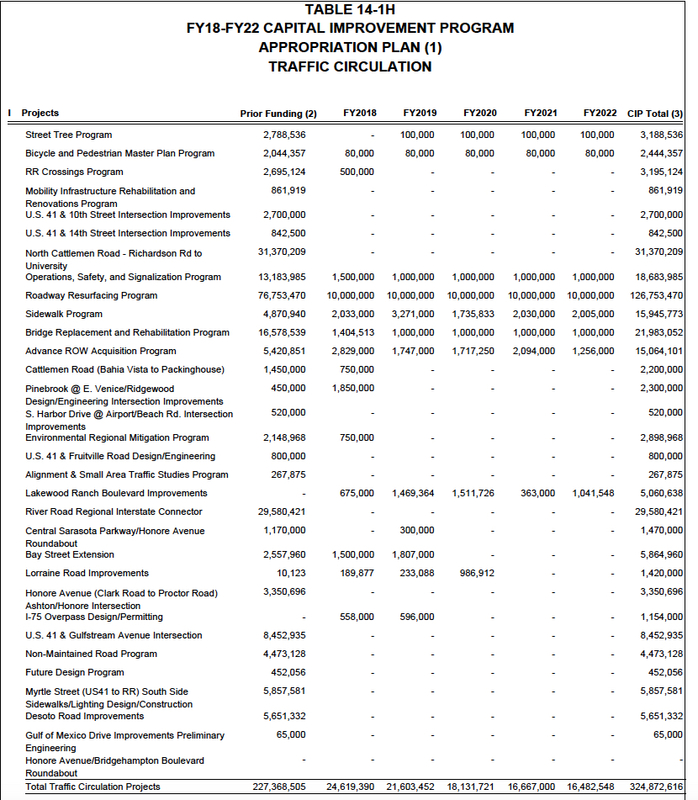 Among the other recurring funding options are a shift in the use of revenue from the voter-approved tax for the county’s Environmentally Sensitive Lands Protection Program (ESLPP) and the delay of capital projects, Lewis noted. During the second hearing on the FY18 budget — conducted on Sept. 26 — Botelho emphasized that the voter-approved millage rate for the ESLPP is up to 0.25 mills. Therefore, after debt service and maintenance of lands purchased through the program are paid for, Botelho said, approximately $4.1 million would be left for acquisition of more property; that could be moved into the General Fund. “Before you start hurtling down a path,” Maio told Botelho on Oct. 10, was it not correct that the board would have to wait until the next fiscal year to shift the use of the ESLPP revenue? That is correct, Botelho replied. As for one-time options: The board could take the approximately $5.6 million money from the county’s fund for economic development incentives, Lewis noted on Oct. 10, and it could transfer the $1.4 million from the county’s Community Reinvestment Program into the General Fund. A third source of potential revenue would come from the sale of surplus lands, he added. Detert expressed hesitation about using the ESLPP option. None of the one-time options was off the table, he said. Maio also proposed that administrative staff set aside time for the commissioners during one regular meeting in November and one in December, so they could start making decisions on specific proposals. “I agree with Commissioner Caragiulo perfectly,” Moran said. However, he continued, the most important step for the board is to plug the immediate $5.4-million hole this fiscal year. “I completely understand what you are saying,” Lewis responded. Even if the board members chose to implement some of the one-time options, Lewis continued, it still would need to decide on measures adding up to close to $11 million in recurring funds to keep from running into budget gaps in the years ahead. “Things need to go through a stress test every now and then to see the integrity of the entity,” Caragiulo added. In response to a question from Maio, Botelho noted that property values still are about 20% less than they were before the economic downturn began. Even though the most recent county Citizen Opinion Survey showed that the public does not want to see taxes raised, Hines added, the public needs to keep in mind that continuing to hold the millage rate steady might mean a lower level of maintenance for baseball or soccer fields, for example. The commissioners need to have that “honest conversation” with the public about what it will accept, he told his colleagues. 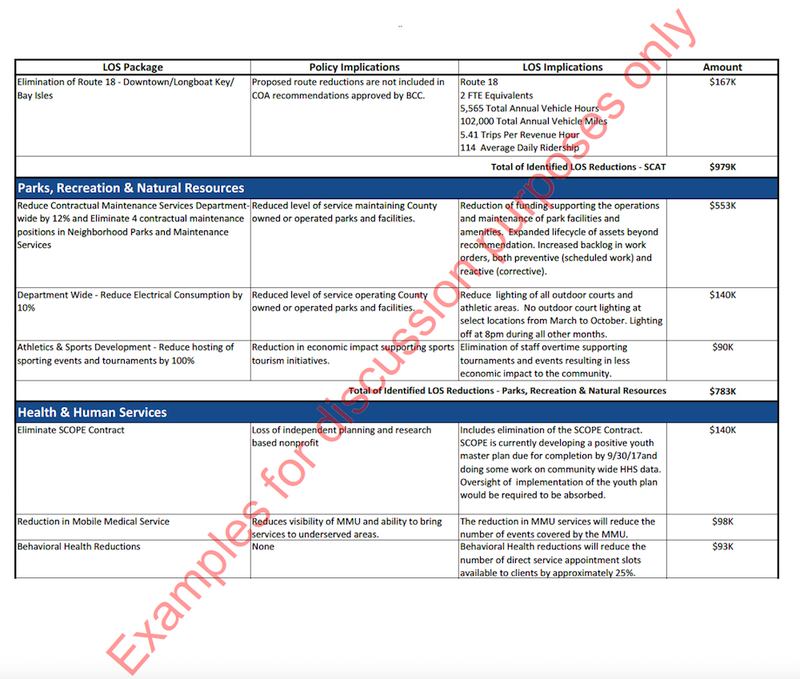 However, she did acknowledge that Botelho showed the board a slide during one of its budget workshops that made it clear that $100 million in new growth translates only into about $350,000 in new property tax revenue for the county. 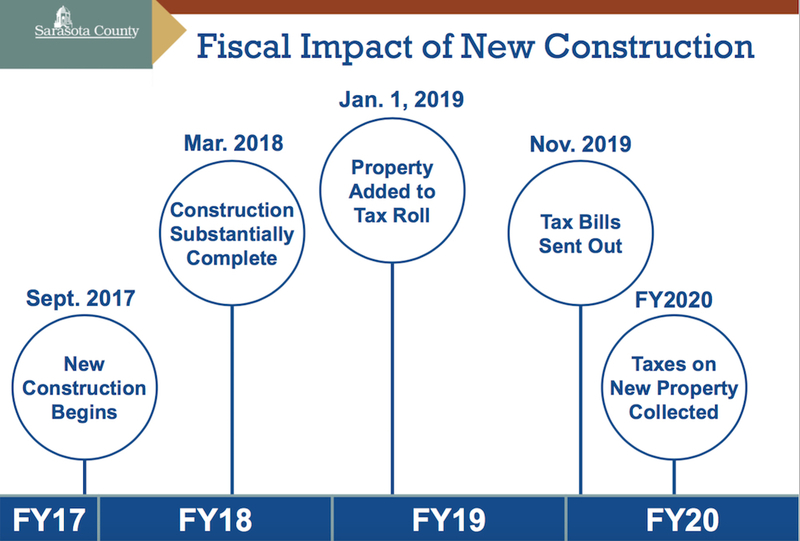 Botelho also had pointed out that it typically takes two to three years from the time construction starts on a new building before the completed project ends up on the county tax rolls, Maio noted.